Boil chicken breasts in water with 1 Chicken bouillon, cumin and 1 garlic powder for 30 minutes or until chicken done through. Let Chicken cool then shred with forks. Pour Enchilada sauce in a large bowl. 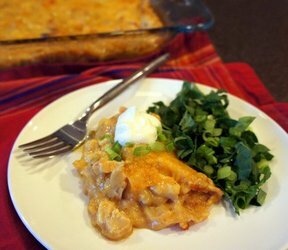 Dip each tortilla in enchilada sauce and lay in a 9X13 baking pan covering its bottom. Add layer of 1/2 of the chicken. Using 1/2 of the cheese, add a layer of shredded Mexican cheese. 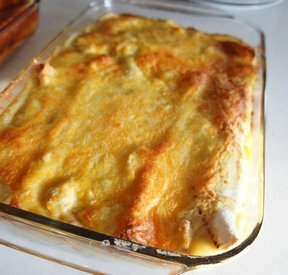 Add a second layer of dipped tortillas, a layer of chicken and a layer of cheese. 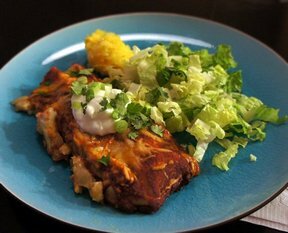 Top with one last layer of dipped tortillas; pour enough of remaining enchilada sauce over everything to coat well and keep tortillas from drying out. Bake at 350° for 20-30 minutes.